A new catalyst for hydrogen evolution could see you carry around a fuel cell in your pocket to power electronic devices. Commenting on a story for Chemistry World last year that employed a homogeneous catalyst to convert formic acid into hydrogen got Edman Tsang of the University of Oxford, in the UK, thinking. So he went into the lab and made a heterogeneous catalyst that does the same job at ambient temperatures, without the need for solvents or additives. 'We went back and thought: why don't we develop a room temperature heterogeneous catalyst using a cleaner system?' says Tsang, who is part of an EPSRC funded consortium investigating hydrogen production from organic molecules. Formic acid - a byproduct of biomass processing - is thought to be a great source of hydrogen for fuel cells, because it has a high energy density and is readily available. But so far, catalysts to produce hydrogen from formic acid have all had drawbacks. Heterogeneous catalysts incorporating noble metals have needed high temperatures, while homogeneous catalysts have managed to work at room temperature, but need organic solvents and additives like amines or bases. Tsang's new catalyst combines the best of both worlds, it is a cleaner system and works at room temperature. The catalyst uses the unique properties of a core-shell system to do things that normal noble metals can't. The palladium outer shell adsorbs the formic acid and splits it into hydrogen and carbon dioxide. To increase the catalytic activity, an electron rich core of silver modifies the properties of the palladium to maximise efficiency. 'For mobile applications, low temperature hydrogen on demand is a big advantage' says Henrik Junge, who investigates formic acid as a hydrogen source at the Leibniz Institute for Catalysis at the University of Rostock, Germany. Junge describes the work as a 'big step' towards using fuel cells to power electronic devices. The new catalyst works at a turnover frequency comparable to other catalysts developed already. 'You'll have to make sure that the amounts of hydrogen produced could be scaled-up to the levels needed for applications' says Junge, but Tsang's back of the envelope calculations suggest in theory the catalyst should be good enough for a fuel cell to power small devices. 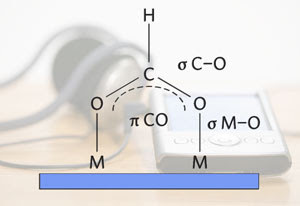 Capsules of formic acid could be plugged into the fuel cell, in your pocket, to power your mp3 player. Bigger devices like laptops will require further improvement to the design. 'There are lots of hurdles before you can get a real device' Tsang says. He is now working to improve the turnover frequency of his device and then says he'll need to work with engineers to work out how to make the concept of liquid fuel and fuel cell into reality.